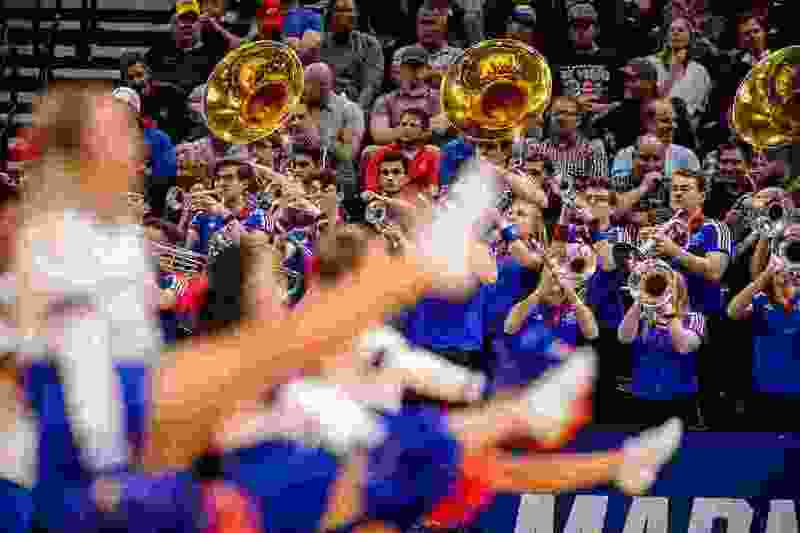 (Trent Nelson | The Salt Lake Tribune) The Kansas band performs as Kansas faces Northeastern in the 2019 NCAA Tournament in Salt Lake City on Thursday March 21, 2019. The wide-open look was so clean, just a few feet away from Steven Smyth, a shot that had it gone in, would’ve been One Shining Moment-worthy on Day 1. But the 3-point attempt fell short, suddenly ending a special season for New Mexico State, but there was no time for Smyth or his group to bow their heads. The one-point loss was a bummer, no doubt. But Smyth’s band played on. They had to. What goes into playing at the NCAA Tournament, where first and second round games are held in Salt Lake City, is much more than simply tooting one’s own horn. There are dozens upon dozens of songs that, at any moment, might be summoned by the director. And, of course, there are the nerves that accompany this time of year. Smyth, associate director of bands at New Mexico State, said the band that saw its Aggies fall so agonizingly short on its side of the court had been playing for the No. 12 seed since nonconference play back in the fall. NCAA mandates that every pep band is a maximum of 29 members during the tournament. Some, like Northeastern director Allison Betsold, have a binder of songs at the ready. Matching up songs with the amount of allowed time is a test. Directors have to have several selections shuffling through their mind depending on time of the game and the situation. Sharon Toulouse, the associate director of bands at Kansas, is like everyone else watching — reading the game in real time. But rather than cheer a dunk or boo a questionable call, she’s thinking of what song the moment calls for. Might be Kanye West. Could be Rihanna. Perhaps Imagine Dragons. And there’s always the school’s fight songs to get the fans rolling or the players’ attention. At a basketball blue blood program like Kansas, pep band members have to know the game, know the players, and know the significance of big moments so that when they board a plane somewhere during March, they’re just as seasoned. Northeastern’s band hasn’t been home all that much lately. First they were in Charleston, S.C., to see the Huskies punch their ticket at the NCAA tournament. Then they went to Delaware to play for the women’s team. Finally, they boarded a plane out of Boston for Salt Lake City, needing to arrive to the airport hours early to check in their awkward-sized instruments. “This is the biggest crowd that we’ve ever played in front of,” said member Elizabeth Curtis. Northeastern senior trombonist TJ Fujiyoshi said there are about 80 songs in Betsold’s binder. The Huskies band brought with them homemade signs, including one that read in all-caps: “BIRDS AREN’T REAL,” a playful jab at the powerhouse Jayhawks. Their primary job is to play and have a blast doing so, but bands in Salt Lake — and all over the nation this week, for that matter — are there to cross all their fingers and toes in hopes their team advances to the next round. There is no consolation for the heartbreak the Aggies endured Thursday, but the band did win the fan vote in the battle of the bands against Auburn. Which has to count for something.